Recent iPhone 8 rumors have suggested Apple may be planning to replace Touch ID with a new facial recognition system, but there's been a lot of question about how Apple Pay will work and whether Apple will indeed be able to eliminate Touch ID entirely. We've already seen confirmation that Apple is working on facial recognition in the iPhone 8 through a recent HomePod firmware release, and now additional information found in the code confirms Apple has a mechanism for authenticating Touch ID payments with a face scan instead of through a fingerprint. 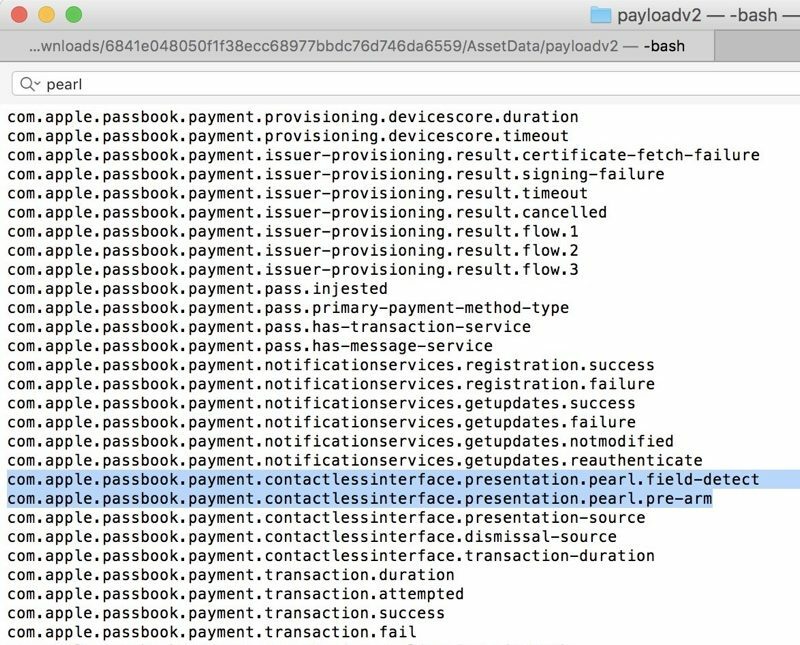 A com.apple.passbook.payment string found in the HomePod firmware by iOS developer @r_idn features two references to "pearl.field-detect" and "pearl.pre-arm" among other payment verification data. As we learned from earlier leaks, "pearl" refers to Pearl ID, the codename for Apple's facial recognition system. Apple's current implementation appears to be incomplete, as pearl is only mentioned under presentation and not authentication. While many are skeptical that Touch ID can be replaced by a facial recognition system that's equally secure, rumors have suggested Apple's facial recognition technique captures more data points than a fingerprint scan, making it more secure than Touch ID. It's not yet clear how Apple Pay will work without a Home button and without a fingerprint, but it will presumably be able to authenticate by scanning a user's face, with a payment completed via a finger on the screen as is the case in current iPhones. Previous HomePod firmware leaks related to the iPhone 8 have suggested Apple has not implemented an under-display Touch ID solution as was initially rumored for the device, and it's looking more and more like there's no other physical Touch ID solution built into the upcoming smartphone. For more on the iPhone 8, make sure to check out our extensive roundup, which aggregates all of the rumors we've heard about the device so far. Lately, we've unearthed a lot of new information thanks to the HomePod firmware, including details confirming infrared facial tracking, the design of the iPhone 8, a split status bar and tap to wake, and an upcoming "SmartCamera" feature. So if I am doing winter sports, I am going to have to take off my face protection rather than just taking off a glove? And if it's anything like Touch ID, I will have to have a face profile for day, night, winter, summer, dry, humid, shave day, non-shave day, good mood, bad mood, sunglasses, no sunglasses, etc. Oh but wait, I'm sure we'll be limited to five profiles. Pearl ID clearly refers to our pearly whites. It will deny access to our iPhone if we haven't brushed our teeth! ADA approved. I'd much rather stick with TouchID. They just introduced Touch ID into the MacBook line so why the hell would they be now trying to eliminate it? If the iPhone 8 (or whatever it will be called) doesn't have touchID in anyway, we are most likely never going to see TouchID under the Display. I doubt they would suddenly feel the need to add fingerprint scanning back, after hyping the **** out of facial recognition. You guys realise it'll have both Touch ID and Face ID, right? Face ID wont replace Touch! How will we be able to go back to home screen from apps? Cue in reports from people who were able to pay by showing the phone a photo of some random guy. I suspect that the facial recognition will utilize infrared (as reported) to detect if it's a real face, combined with 3-D modelling. So flat photos will not work. I find it funny, that no one, no website, no apple-community commentator - explores the angle and thoughts on "what if this leak is a hoax, a purposely planted misinformation from Apple"...? to throw us all off course... or throw the competition off course..?